It's about midweek that we all feel a bit of a lull. We aren't as fresh as we were at the start of the week. But we aren't close enough to the weekend to get excited about family time either. So to pick us up, inspire us, give us something to think about or smile to, or just to empathize with any kind of feeling, I'm introducing Wednesday words. 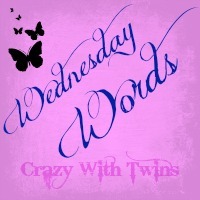 Every Wednesday I will blog a quote, a lyric or a poem. 1. Blog a Quote / Lyric / Poem - You may include a brief introduction if you so wish. 2. CREDIT! If you are not the author - you MUST credit the original author. If you do not, you will be violating copyright. 3. Grab my badge and add it to your post. 5. Read some others, comment, share, spread the love! If you tweet your links to @crazywithtwins I will retweet them for you. 11th Dec 2013 - Bravery or survival? 7th Aug 2013 - Who are you? To grab my badge, highlight the code below and press CTRL and C at the same time, then paste into the html of your post. If the code doesn't work, delete the speech marks and retype them.